Another step of "the Plan" was crossed off this month. I made an offer on the land described in the last post, and after some negotiation, it was accepted. 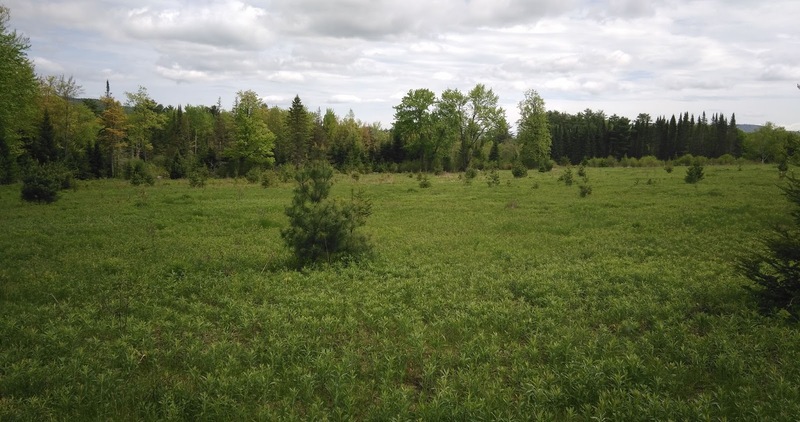 Having closed, I am now the proud owner of some 20+ acres of old dairy pasture and mixed forest. My search criteria didn't seem complicated; I wanted more than 10 acres of land, and I wanted it for less than $100,000. I wanted a water source, a variety of wood, and some fields would be nice. The workable parcel ought to be close to family up North, or close to work down South. A compromise would make for a long commute over the next few years and lack of family nearby (less than ideal.) Ultimately, I decided to trust my gut and buy up North in the mountains and hills, and not in the South, which is growing busier and more congested by the year. I must have toured two dozen properties over the past few years... possibly more that I've forgotten. The biggest thing I learned was that there is a reason that cheap land is cheap. Fifteen minutes on Google can save two or three hours of driving, burning gas, and hiking through the woods. The terrain feature on Google Maps saved me from ascending many cheap cliffside properties, and helped in identifying such infrastructure as highways, high-voltage transmission lines, waste treatment plants, snowmobile trails, and even power substations. Ultimately, I did find land that was cheap for a reason, but for a reason I would be able to tolerate for the price! I figure that the more workable land I get for my dollar will save me, later. On a 5 acre plot, I would not have enough trees to build a home, and heat it with wood from the lot. With 10 acres of land that becomes more realistic. Being patient and finding enough land would save me down the road in buying outside resources. My search parameters changed as I learned how to search for property, through trial and error. One plot in Canterbury had everything I was looking for, but I learned that the rules for buying land were different from those of home-buying. I couldn't afford the $150,000 land purchase without a significantly larger down payment than an equally priced home, which would take a few more years of saving. I lowered my "maximum price" to $100,000. Not only was this a better financial decision, but it trimmed my list of candidates down to something more reasonable. I also found a map from 2009 with every town's property tax rates, which, even if it is slightly outdated, provided a handy guide for which towns I didn't want to pay to live in! I'm thankful that one of my pilots was my realtor; someone that understood my slightly unorthodox needs, and was patient through the search. He was happy to send in my offers which included owner financing. Sadly, the former owner did not accept my offer, and a bank will be making the thousands or dollars that he could have made. Now the name of my game will be paying off the mortgage as fast as possible to pay the bank as few of my dollars as I can. The amount of interest I'm paying, the rates of the loan, and the terms of the loan are another rant entirely. 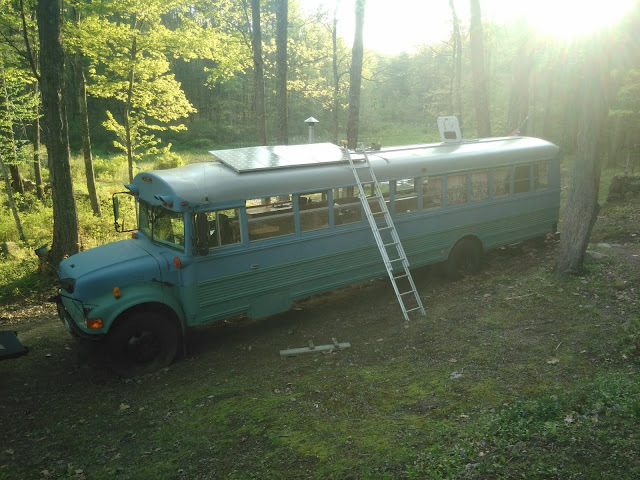 My goal here is to pay off the land quickly, and return to a debt-free status while still having enough cash on hand to buy and build as needed. I find the banking system doesn't like to deal with a land purchase of this size. I asked my bank of choice for a 10-year fixed rate loan, and they wouldn't do it (good credit, money down; won't do it.) And yet, as long as you secure a loan with no prepayment penalty, a 20-yr loan can easily be made into a 10-yr (or even a 6-yr!) by paying against the principal. You just don't tell the bank that you're going to do that. I don't feel like I should have to hoodwink a bank in order to get a reasonable loan. The former owner was seeing traps in owner-financing, despite the assurances of both realtors, and the bank wants their interest. Trust is hard to come by. What a lame post, huh? No pictures. 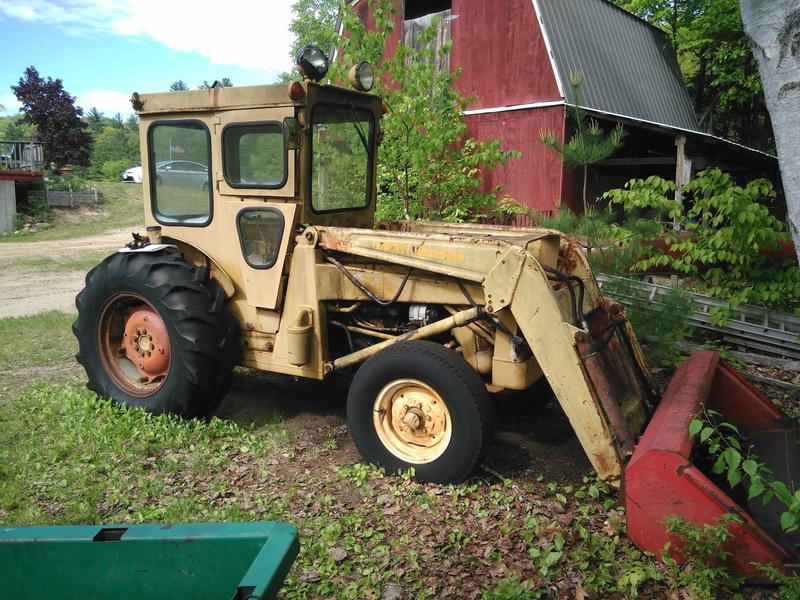 This is my buddy Gavin's new tractor, a beautiful 1971 Massey Ferguson MF-20 Industrial Loader (we think!) It was generously handed down to him by his grandfather, David, who gave us a tour of the family's farm in the White Mountains. In the coming weeks Gavin and I will do the maintenance to get it running again, and trailer it to Gavin's house. I finally got the solar panels mounted on the roof of the bus, after five months of waiting for a day off without rain in the forecast. 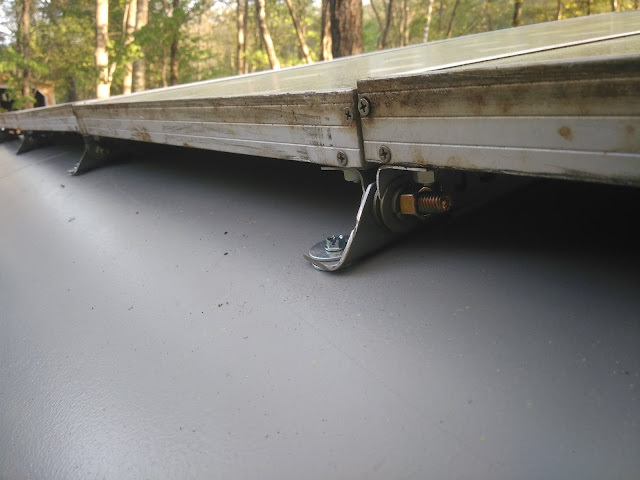 Wanting a nice even line, and a low profile, I used a square to measure 18" from the "rail" of the bus roof, and drilled the holes for each mount one at a time, as I mounted the panels. Once all the mounting feet were in place (as pictured,) I loosened all of them, applied a liberal amount of RTV, and then snugged all of them to the bus skin. 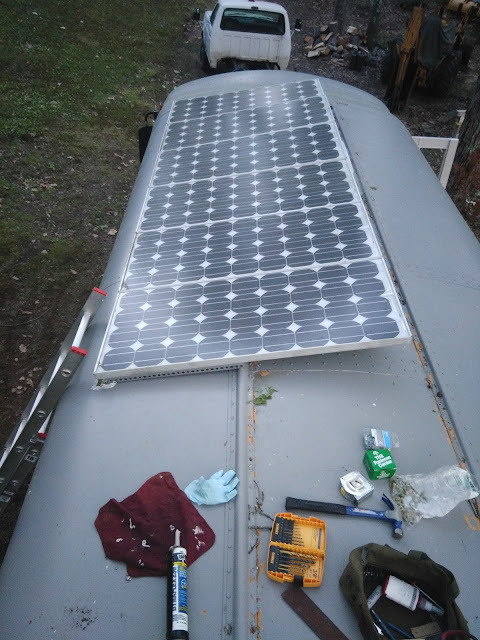 The panels are installed in their proper order, now they need a mechanism to hold them upright, and to be wired into the bus's battery system. Projects are on hold at the moment, as I'm out of country with the Unit on mission for a few weeks. I think it's about time to burn some leave, at work.